Check out our vast collection of embroidery designs dedicated to the forest inhabitants. This design in particular features a sleeping fox coming as a colorful mix of honeysuckle, saffron, pro maize, almond and charcoal. The fox has curled cozily and tucked its long tail under its head. Its luxurious fur is of varying shades of red and gray. This beautiful animal embodies longevity and wisdom and will become a gorgeous decoration for your favorite items ranging from sweaters, workout outfits, jackets and sport bags to cushions, bed linen, pajamas and anything in between. Works with all fabrics. I'm ailed with a fox-addiction) Like this pattern so much! Stitched out this digital design on my purse. It guards my money now. I love how this stitched out. Embroidered well. Delivered immediately. 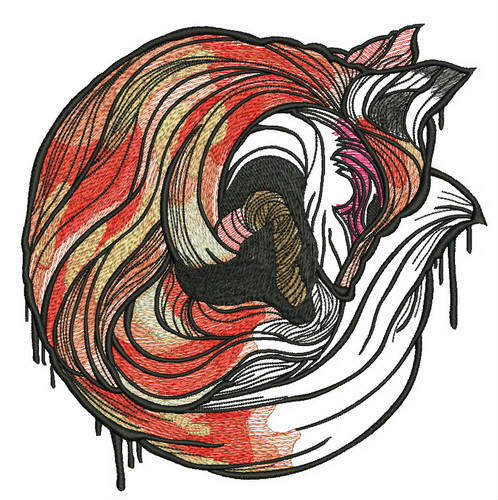 Do you see a heart in the middle of the fox-circle? Do you know that the eco-situation is tragedic for foxes? By reason of global warming, foxes are forced to migrate. They even attack cities...scrapyards. Sorry, I'm too serious. I wanted to say, that this digital design leaves nobody indifferent. Thanks or your job!